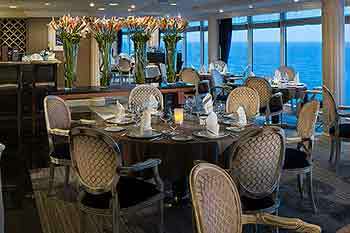 You'll love the contemporary, inventive Italian cuisine at Aqualina, featuring some of Italy's most famous dishes. Starters include beef tenderloin carpaccio with orange oil, lobster ravioli, and seared tuna wrapped in veal, followed by second courses such as sweet pea and fennel soup or delicious salads of watermelon and tomato or arugula and radicchio with prosciutto chips. 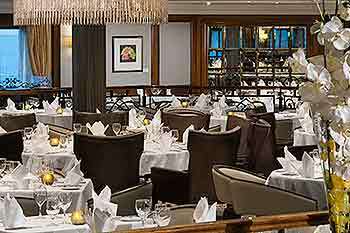 Main courses include forest mushroom risotto, a perfectly grilled veal chop, a Venetian seafood platter or delicate dover sole. Save room for Azamara's famous desserts like marsala custard, lemon soufflé, tiramisu and chocolate torte. 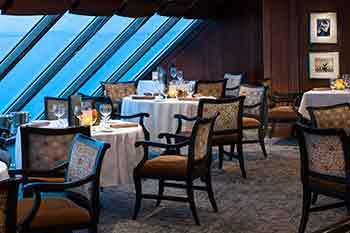 Settle in for a marvelous evening at Azamara's classic wood-paneled steakhouse with stunning views and lush autumn décor. The menu includes steaks in a variety of cuts cooked to perfection, along with starters like crab cakes with remoulade, lobster bisque, wedge salad with bacon and blue cheese, and more. Other entrée choices may include lamb, pork, veal chops, game hens and seafood. Indulge in the famous mini cinnamon-sugar donuts with a trio of dipping sauces for dessert. 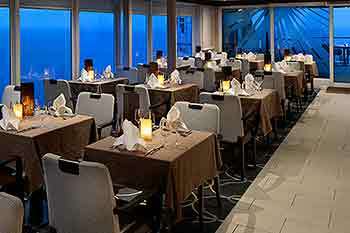 Azamara proudly features two specialty restaurants, Prime C and Aqualina. 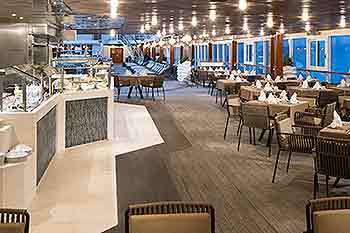 Specialty dining is complimentary for suite guests (Club World Owner's Suites, Club Ocean Suites and Club Continent Suites). For others, there is a $25 per-person cover. Reservations are highly recommended.